I don’t think we’re wasting people in space. I’m going to take over on the Techno Comics so I’m going to be dealing in the children’s merchandising type department. But that’s just setting it up and having somebody run it. Man must be in space – that is what we are destined for. There is nothing else that we can do. So we all got basically what we wanted, and as far as the women are concerned, he figured that 30 good women could handle a crew of 300 anyway. So that’s how we ended up with our crew. The best way in the world to advertise is to get somebody else to run around with the name of your product on their person or showing it around somewhere and not only that but they’re paying for it. When we started out in ’64, um, I was playing Number One, which was a woman second in command of a star ship. 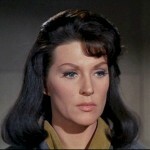 Majel Barrett Roddenberry was an American actress and producer. She is best known for her role as Nurse Christine Chapel in the original Star Trek series, Lwaxana Troi on Star Trek: The Next Generation and Star Trek: Deep Space Nine, and for being the voice of most onboard computer interfaces throughout the series. She was also the wife of Star Trek creator Gene Roddenberry.